Humans appear to abhor incompleteness. This holds as much in the arts as it does in other parts of life and there appears to be little worse than an artwork which has not been finished due to the artist's untimely death. Of course, this desire to tinker with the unfinished does not come without its problems. Mozart died with his requiem D minor, K. 626 unfinished. It was completed from scraps of notes he left behind by another’s hand, the difference between the two parts is noticeable with Mozart’s music being simply sublime, and the rest is kind of ok. The same can be said of Frank Herbert’s Dune, the first book of which remains a masterpiece of science fiction. On his death more novels were extrapolated from the notes he left behind. The new novels were ok but they were not Herbert. Charles Dickens also died mid creation leaving his last novel unfinished and like any other tantalising conundrum someone just had to come along and finish it. The Mystery of Edwin Drood (2012. 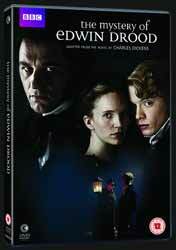 120 min) is a costume mystery/drama, based on the novel of the same name by Charles Dickens. The adaptation stars Matthew Rhys, Freddie Fox and Tamzin Merchant. This is not the first time that the tale has been finished with adaptations appearing on the large and small screen as well as on the radio. The name of the story is a bit of a misnomer as the stories central figure is that of John Jasper (Matthew Rhys), uncle to soon unfortunate Drood (Freddie Fox). Drood is to be married to Rosa Bud (Tamzin Merchant) and a handsome young couple they do make. Unfortunately for them, Jasper is not only an opium addict but also lusts after Rosa. So, when Drood appears to go missing the most likely murderer is his increasingly unhinged uncle. We cannot know what Dickens intended for the stories end and this is where finishing another’s work becomes a problem. The first half of the story remains strong while the second half is good, but you can feel the change and the resolution is a little unsatisfying. Regardless, the actors put in good performances, especially Rhys as the slightly, more than unhinged Jasper. It’s a BBC adaptation so it looks good, though I did have an issue around cleanliness, at least the overabundance of it in scenes which showed the poor. In the end a satisfying period piece and I suppose with the author dead, the best you’re going to get.